There are a number of gateway destinations that provide access into Sedona. 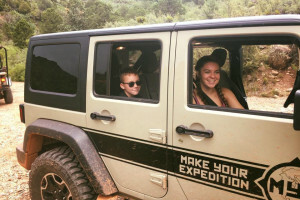 Depending on where you are traveling from you can easily get to Sedona via Phoenix, Flagstaff, Grand Canyon National Park, Las Vegas, Salt Lake, City, Albuquerque, and Los Angeles. Major airports are located in Phoenix and Flagstaff, which both provide a wide selection of ground transportation to Sedona. What is the best route for driving into Sedona? From Phoenix: Take I-17 North towards Flagstaff. Drive 98 miles to Exit 298 and turn left onto State Route 179. Drive 14 miles to State Route 89A. This intersection is the start of uptown Sedona, where you will find lodging, tourist information, shops, and restaurants. From Flagstaff: There are two routes to Sedona from Flagstaff. If weather conditions are good, take the scenic route through Oak Creek Canyon. Take State Route 89A South for about 23 miles to arrive in uptown Sedona. If it is snowing you may want to take the alternative route. Take I-17 South for 41 miles. Exit right on State Route 179. Drive 15 miles, through Village of Oak Creek, to Sedona. From the Grand Canyon: Take Hwy 64 South to I-40 East towards Flagstaff. Follow the above directions from Flagstaff. From Las Vegas, NV: Take Hwy 64 South to I-40 East. Take I-40 East to Flagstaff. Follow the above directions from Flagstaff. From Salt Lake City, UT: Take I-15 South toward Las Vegas. Take Hwy 93 South to I-40 East towards Flagstaff. Follow above directions from Flagstaff. From Albuquerque, NM: Take I-40 West for 320 miles. Take exit 195 for I-17, keep left and merge on I-17 South. Drive for 2.7 miles and take exit 337 toward Arizona 89A South. Take 89A South for 23 miles to arrive in Sedona. From Los Angeles, CA: Take I-10 East to Phoenix. Take I-17 North towards Flagstaff. Drive 98 miles to Exit 298 and turn left onto State Route 179. Drive 14 miles to State Route 89A to arrive in uptown Sedona. Probably your most convenient option, Phoenix Sky Harbor serves all major airlines and is only a 2-hour drive away from Sedona. Location: Downtown Phoenix, about 119 miles south of Sedona. Flagstaff Pulliam airport is the closest commercial airport, and lands you about 40 minutes north of uptown Sedona. Location: Located at Hwy 17 and Hwy 487 just South of downtown Flagstaff. Take state route 89A South for about 23 miles to land in uptown Sedona. Airlines: US Airways connects at Phoenix Sky Harbor Airport. Sedona Airport is located in the heart of Sedona but only serves small private planes and chartered tours. Location: Centrally located, atop Airport Mesa, just 5 minutes from uptown Sedona. Airlines: There are no commercial flights; only small private planes have access to the Sedona Airport. Do I need a car to explore Sedona? Renting a car is the best way to get around Sedona on your own schedule. There are car rental agencies located at both Phoenix Sky Harbor Airport and Flagstaff Pulliam Airport, as well as in Sedona.